The very first Chandler Art Walk took place on February 7, 2007. The 3rd Fridays Art Walk was originally a Chandler Art Guild event. In the fall of 2007, the Downtown Chandler Community Partnership took responsibility for the Art Walk, and renamed it the Downtown Chandler Art Walk. It took place on the first Wednesday of the month. In February 2010 they changed the 1st Wednesdays to 3rd Fridays. Are you still with me? Here's all you need to know right now -- the Downtown Chandler Art Walk takes place on the 3rd Friday of every month, except during June and July (2017). You'll see many varieties of art displayed and for sale at the Downtown Chandler Art Walk. Photographs, pottery, blown glass, original paintings, jewelry, sculptures and more line the sidewalks. More than 50 artists participate on those special Friday evenings. Hundreds of people attend the Art Walk in Chandler each month, and the Downtown Chandler Community Partnership makes a special effort to include the businesses located in downtown Chandler. A permanent location for artist studio spaces and offering art classes is right on Boston Street. Many of the merchants in Historic Downtown Chandler stay open for the Downtown Chandler Art Walk. There is plenty of room for everyone at Downtown Chandler Art Walk. The two main display streets have shade cover and light. You'll be happy about that shade during the hotter months. The Downtown Chandler Art Walk does take a break during the summer, because even shade doesn't make for a very comfortable evening outdoors during August. 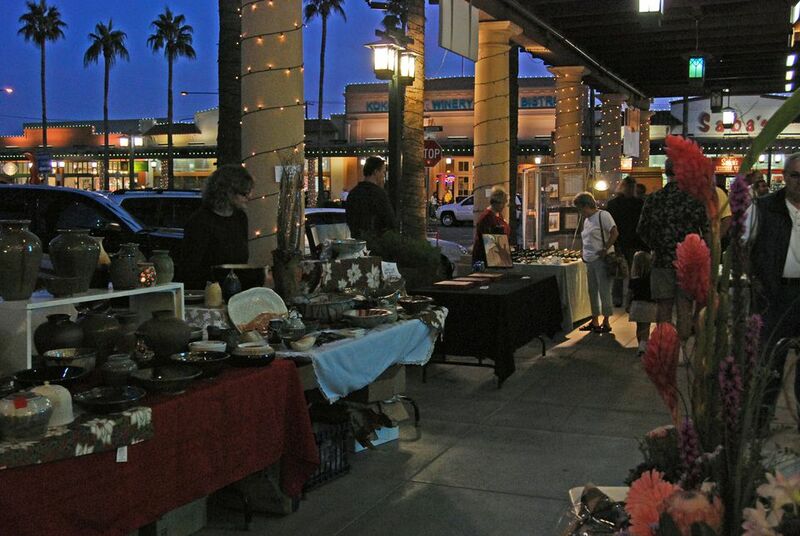 Downtown Chandler Art Walk does not allow artists to display any mass-produced artwork. Jewelry artists must either create or design their own jewelry, and only hand-made crafts are allowed. You won't see any imported or manufactured items here. Historic Downtown Chandler offers several spots where you can rest from your browsing and enjoy some snacks, some coffee and dessert, or a glass of wine. You might want to stop at El Zocalo Mexican Grille or the SanTan Brewery. If you want to shop for gifts made in Arizona by Arizona companies and artists (not not necessarily hand-made) one of the best Arizona-themed gift shops is in Downtown Chandler. Stop in at Sibley's West while you are at the Art Walk. Chandler is a city located in the East Valley of the Greater Phoenix area. Downtown Chandler Art Walk takes place on the sidewalks of Historic Old Town Chandler, near the intersection of Arizona Avenue and Chandler Blvd. Dr. A.J. Chandler Park in downtown Chandler hosts various events throughout the year, including festivals, family events, and free summer concerts. The Chandler Public Library, Chandler Senior center and Chandler Municipal government offices are in downtown Chandler. There are several shops and cafes in downtown Chandler. The Chandler Art Walk is across the street from Dr. A.J. Chandler Park. There is no admission charge to attend the Chandler Art Walk. The event takes place on the third Friday of every month, except for June and July (2017). The August art walk moves indoors due to the hot weather. Check online before you go! From the South: Take the Loop 101 north to the Loop 202 East. Exit Arizona Avenue. Turn left (north) to Boston Street. From the North: Take I-10 east toward Tucson. Past Chandler Blvd, take Loop 202 east. Exit at Arizona Avenue. Turn left (north) to Boston Street. From the East/West: Take US 60 to the Country Club (Route 87) exit. Turn south. Country Club becomes Arizona Avenue in Chandler. Past Chandler Blvd. you'll see A J Chandler Park on the east side of the street. See this location on Google maps. There are several free parking lots around Historic Downtown Chandler, and some municipal parking lots on Boston Street east of Arizona Avenue. The Art Walk event extends from Boston Street, along San Marcos Place, and just south of the Crown Plaza San Marcos Hotel and Golf Resort. Occasionally, in the summer, it will be hosted indoors by one of the downtown businesses. Tip: The best place to park is in the lot immediately south of Boston Street on Arizona Avenue (some of it is paved and some of it is gravel). The entrance to the lot is the first driveway on Arizona Avenue that is south of Boston on the west side of the street. From there, walk through the "Breezeway to the Shops" and you are there! Downtown Chandler Art Walk takes place on the third Friday of each month (except August and September). Art is displayed from 6 p.m. until about 10 p.m. There is no admission charge — it's free for everyone. Browse, shop, watch the people, bring the kids...enjoy! Do you have more questions? Visit Downtown Chandler Art Walk online.